A lot of photography students often ask me where I draw inspiration from when capturing images or creating a concept. Having a drawing & painting background and an interest in art has given me the opportunity and desire to explore different forms of art. I love spending time at art galleries, both local and around the world, soaking up inspiration and new ideas. How artists express the work they do is such a personal journey. What they create is often an extension of their heart and it is their life experiences that brings life and inspiration to the things they create. So I decided to start up a new blog post called The Art Files. These posts will feature artists and current exhibits of interest in hopes of helping those who read it draw inspiration and dialogue. A couple months ago I was in Hong Kong and had the chance to visit the Andy Warhol Exhibit at the Hong Kong Museum of Art. For only $20HKD (equivalent to a measely $2.63CDN), I got to explore the wonderful world of Andy Warhol. The collection was a restrospective of his work, over 400 paintings, photographs, screen prints, drawings and more. This iconic statement from Warhol sets the tone for the exhibit. 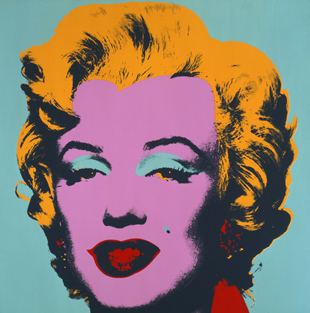 Warhol's work epitomized pop culture and he was instrumental in paving the way for the rise of the Pop Art movement. His repertoire of work stems beyond a mere fifteen minutes of fame, thus the reason the exhibit was adequately coined 'Fifteen Minutes Eternal'. The exhibit was a perfect retrospective of his work, starting with illustrations he made during his early career in the 1950s as a commercial illustrator (apparently, he did a lot of shoe ads:) As you can see, his early work was more poignant, clean and slightly delicate in comparison to the silkscreens he created later in his life. But it was the 1960s that made Warhol the most well-known artist for pop art. You know what I mean when you see the silk screen works of Marilyn Monroe & the Campbell's soup cans. Apparently, Warhol was meticulous about the reproductions of the soup cans, ensuring every detail, curve and color was as exact to the original soup can designs as possible. Now that's a mark of a true illustrator! As his notoriety flourished, so did his social network. He hung out with socialites, celebrities and all those who were well-known in the New York scene. And as his social network grew, so did the vast collection of celebrity portraits and this eventually became one of his main sources of income. Most images were captured with a poloroid and then made into silkscreen. And then of course, there were the hundreds of self-portraits taken of himself. You can call him a narcissist, but I call him brave! I've done some self portraits myself and I can honestly say it is a difficult thing to pose in front of the camera instead of being behind one. Was he a pack rat, hoarder, or just an artistic historian?? Warhol created Time capsules, 612 boxes that included letters, magazines, photographs and other momentos that spanned two decades of his life. At the exhibit, they featured capsule-23 that highlighted items Warhol personally collected during his visit to Hong Kong in 1982. Warhol did lead quite a glamorous and eclectic life, and you can definitely see his flamboyant nature in much of his work. But through the exhibit, I sensed he was more than an artist, he was also a very savvy business person:) He quotes "Making money is art and working hard is art but good business is the best art". Warhol definitely had a unique perspective on life and art and I believe by using pop culture within the context of art, he was able to communicate a relatable message...that "Pop art is for everyone." He was able to find simple things like a soup can to connect with his audience!